Get notifications whenever we post - just enter your email address here. Pisco: Ah, Pisco. I first came to love Pisco in Peru but it wouldn’t do to admit that in front of a Chilean. The neighbouring countries have had a few beefs over the years, not least of which is the (at times legal) dispute over which country is the birthplace of the stuff. Pisco is a type of brandy invented by 16th-century Spanish sailors and most commonly drunk in the form of my favourite cocktail, the Pisco Sour. 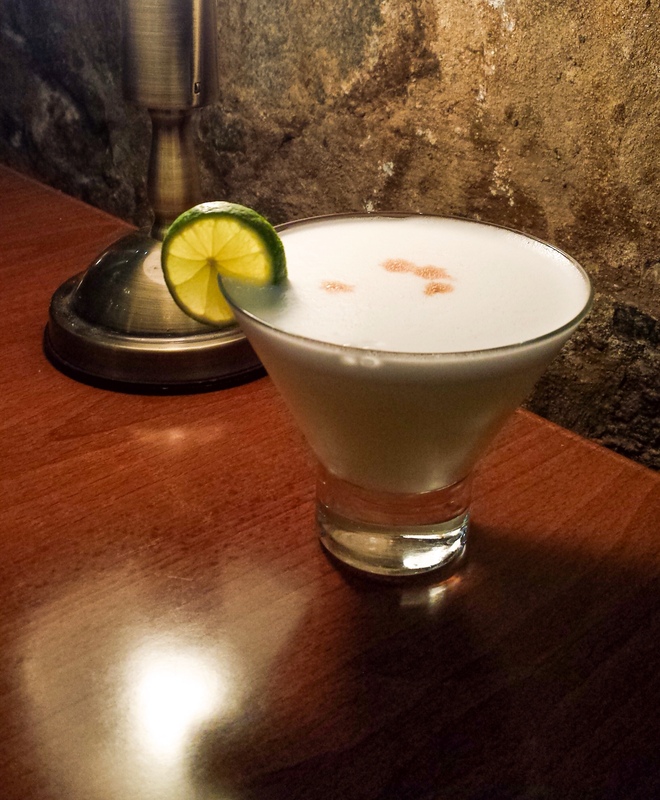 In Peru, the recipe is pisco, lime, sweet syrup, ice, egg white and Angostura bitters. The Chileans miss out the egg white and Angostura, a mistake in my view. Pisco Sour WITH egg white. Sorry Chile, it’s just better this way. 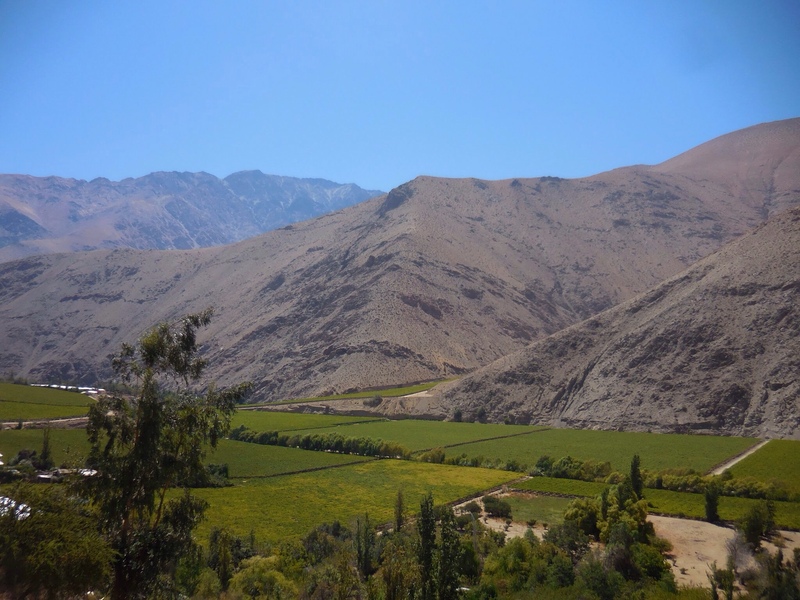 A great way to find out more about Pisco, and enjoy some stunning scenery besides, is to visit the Elqui Valley near the seaside town of La Serena. 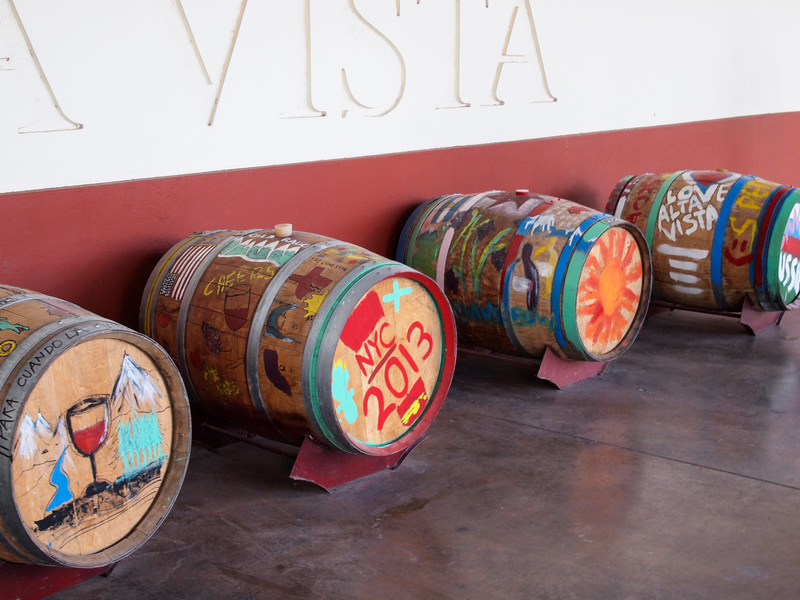 Here you can visit some of the oldest Pisco distilleries. I did the day trip alone, as Franki was feeling under the weather, but still had a marvellous day out. I mean…just look at the place. Pisco vines in the beautiful Elqui Valley. Stunning. 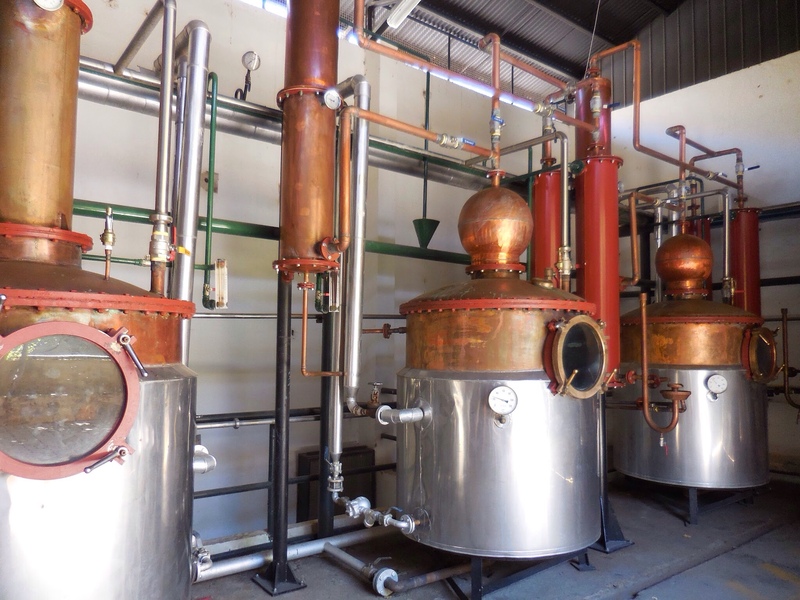 I took a cheap shared collectivo taxi to the town of Vicuna, from where you can get the bus to Pisco Elqui, or even further to the wonderful Fundo de los Nichos distillery, founded in 1868. Foolishly, I walked the three miles from Pisco Elqui in blazing sunshine, not realising that the bus route continues along the same road. The distillery tour was in Spanish, as I happened to arrive at the wrong time for the English tour, but it was still fascinating. The place is dripping with tipsy history. Here’s a mural commemorating (if my Spanish serves me well) the day when women were allowed into the distillery for the first time. I’m not sure if this is a good advert for Pisco but why not? When the tour guide isn’t looking, you can dive right into those vats. …and the tasting enlightened me to the fact that premium Pisco can be drunk neat, like any other brandy. Anyway, the Elqui Valley: Education, booze and scenery, what’s not to love? If you’re in Santiago, check out the Chipe Libre restaurant on Lastarria. The food wasn’t stunning but they offer both Peruvian and Chilean versions of the famous drink, plus a tasting flight for would be connoiseurs. Wine: While Argentina is the home of Malbec, Chile is probably better known for reds such as Cabernet Sauvignon and Carmenere. It also has a reputation in some parts of the world (I’m looking at you, hypocritical Australia!) for producing some cheap and terrible wines. Britons will probably be most familiar with Casillero del Diablo, famous for being the wine people bring to a dinner party chiefly because of its ubiquity on the shelves of every corner shop in the country. Chile certainly does export some rubbish, as anyone who has travelled in Asia will know. But it’s such a large country (well, north to south at least) that it has plenty of top wine-making regions, such as the Maipo and Colchagua valleys. 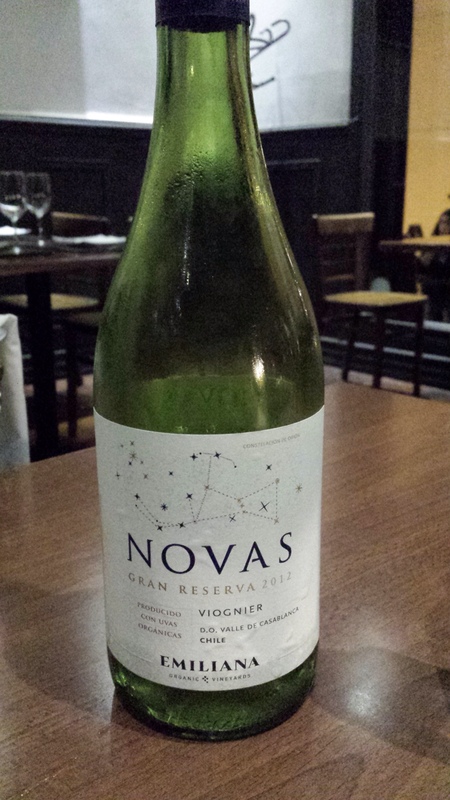 We weren’t here for long enough to sample that many but one recommendation is this Novas Viognier from the organic Emiliana vineria. My notes also include a smiley face next to a picture of Hoyco del Limor Reserva Especial Pinot Noir 2013. I can’t for the life of me remember anything about it and a Google search suggests it doesn’t exist. Perhaps I dreamt it. If you’re in Santiago, do not miss the wonderful bar/resto Bocanariz, where delicate tapas dishes are paired with an excellent selection of wines from all over Chile. Beer: Chile is a very wealthy country by South American standards and as such, it has a wealth of very good craft beers. One great place to sample them is the kaleidoscope of colour that is the UNESCO heritage town of Valparaiso (read about this beautiful town here). 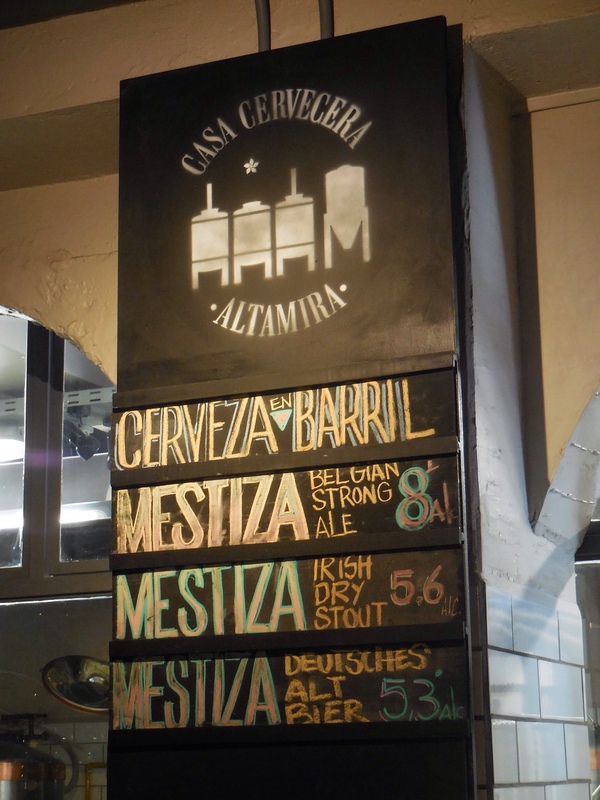 The Casa Cervecera Altamira has a wonderful range from light ales to smoky German Altbiers, right in the bustling heart of Valparaiso and, thankfully, at the bottom of one of it’s extremely steep hills. 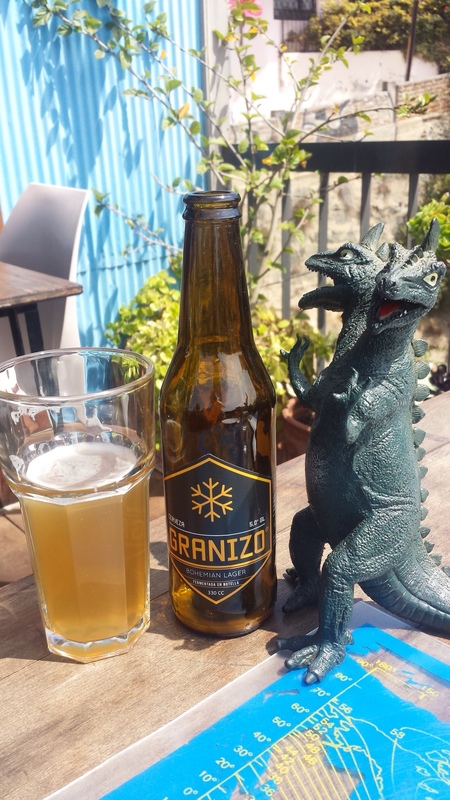 Most bars also have a decent range of bottled craft beers, such as this crisp and refreshing Granizo, seen here being menaced by a two-headed dinosaur. Alcoholism, not meteorites, killed off the two-headed dinosaur. True story. Top tipple: Seeing as i’ve already declared it my favourite cocktail, the winner has to the Pisco Sour. I’ll confess to preferring the Peruvian version but the Chileans do a fine job too. Bubbling under: Altamira’s American Pale Ale went down a treat with Franki so we’ll go with that. Gourmet’s choice: Pisco Mistral 35. Dark yellow, woody, a very expensive and delicious way of clearing out the cobwebs from your entire respiratory system. What to slur drunkenly: Pisco de Peru? Andate a la chucha! This is best left untranslated. It’s finally here! After three long months of wine-free gloom, we arrive in Argentina, home of the world’s best Malbec and plenty more Bacchanalian delights besides. Wine: We’ve been greedily awaiting this moment like vultures circling a wounded wildebeest. 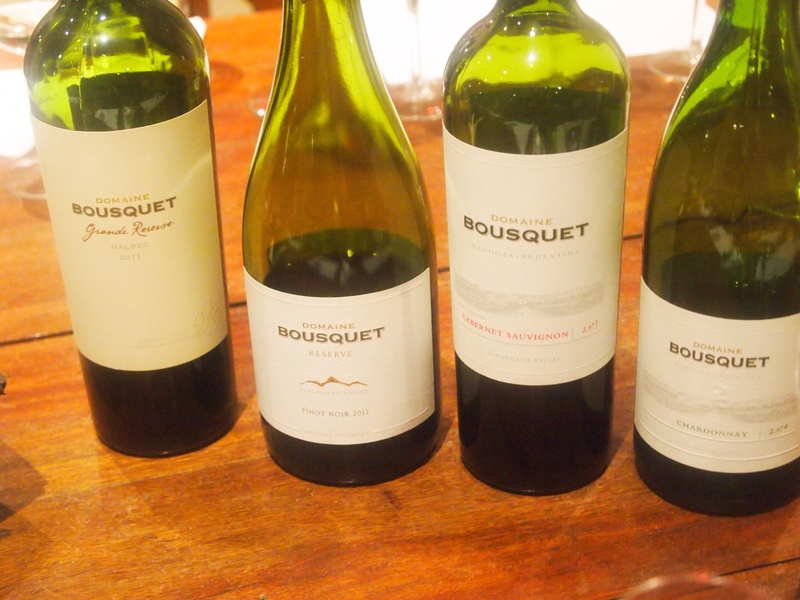 Argentina’s wines are many and marvellous. They are also inexpensive as long as you’re changing your money on the blue market (read about how to do that in our upcoming blog Argentina: The Debrief). The Malbec grape was brought to Argentina in the 19th century at the request of Argentine statesman Domingo Sarmiento. 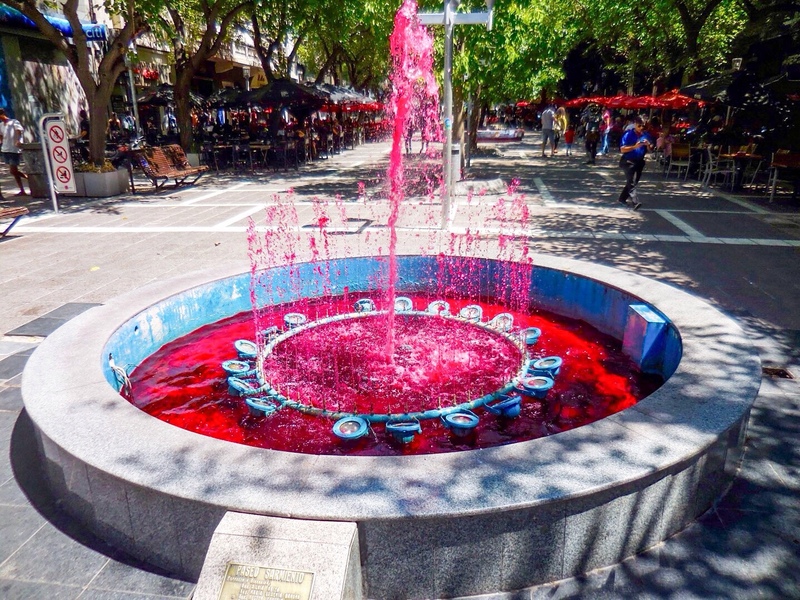 They’re still naming streets after the guy in Mendoza, where wine is such a big part of the culture that they even have fountains of the stuff. Disclaimer: Didn’t actually try it but i’m pretty sure this isn’t actual wine. The city of Mendoza is the beating red heart of wine country and its dry, hot and mountainous terrain makes for some incredible Malbecs. From here you can tour the traditional wine-making valleys of Lujan de Cuyo and Maipu, or the Uco Valley, which is globally renowned for the art of high-altitude wine-making. 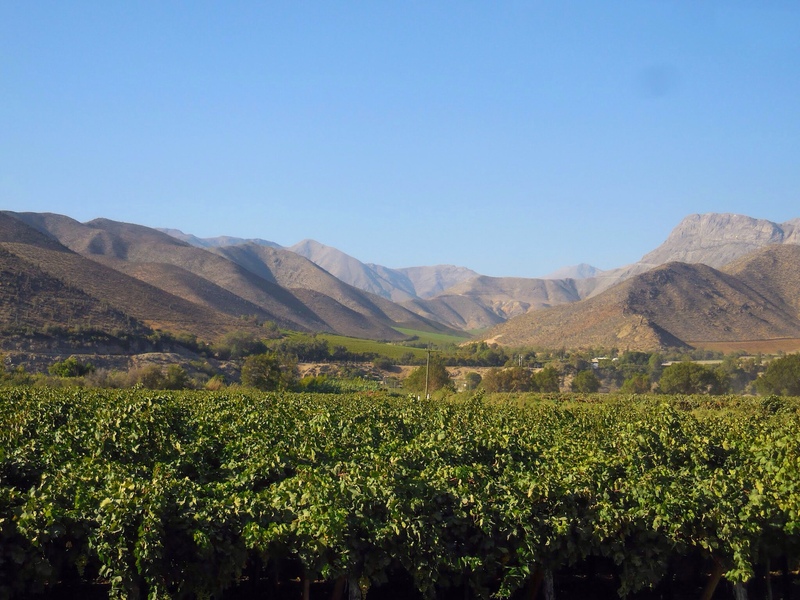 Check out our post on Mendoza wine tours here. Malbec isn’t the only red wine in town. You can find good Pinot Noir, Cabernet Sauvignon, Tempranillo and Bonarda. 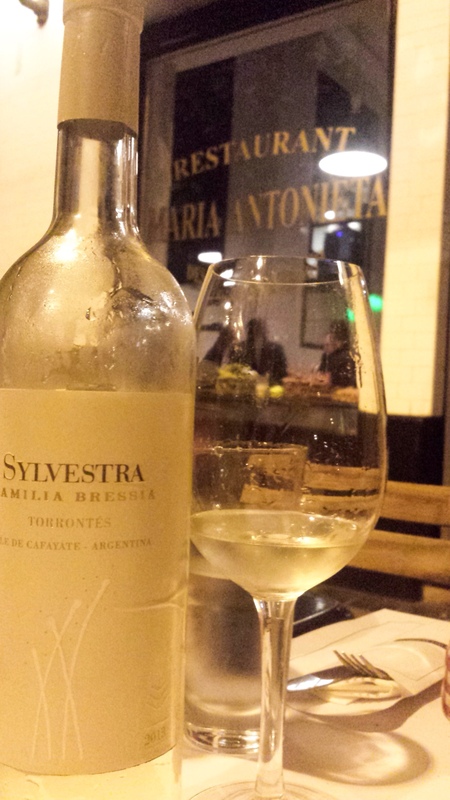 And while red wine is dominant here, we fell in love with Torrontes, Argentina’s only native grape. It makes a delicious white wine, sometimes nicknamed ‘The Liar’ because it is very sweet and fruity on the nose (reminiscent of Gewurztraminers or Muscat) but crisp on the palate. I was partial to Sol Fa Sol and the Sylvestra (pictured below), but Alta Vista also do a nice Torrontes. 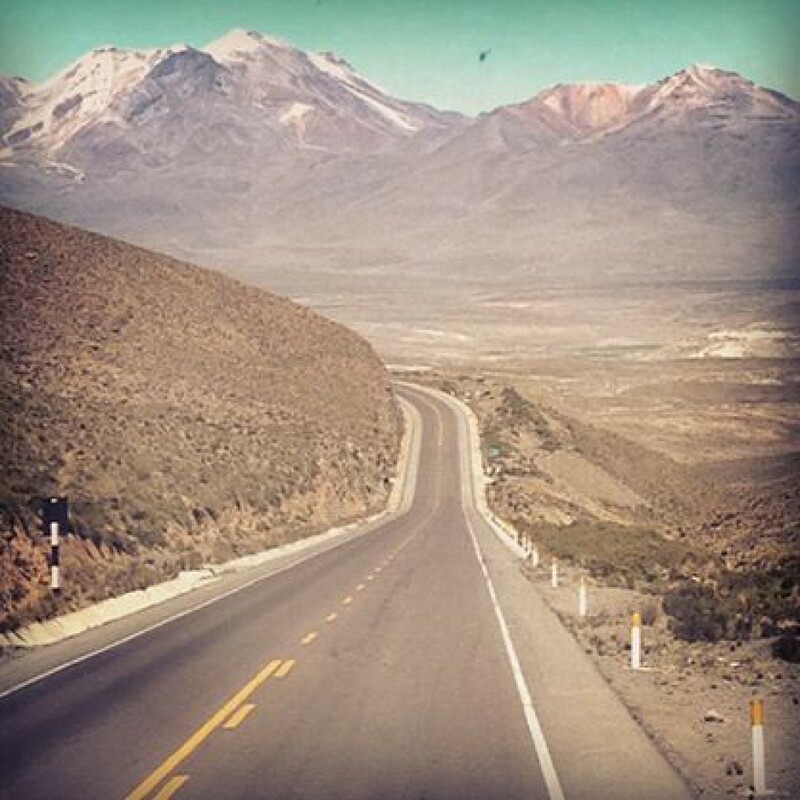 Remember, if you’re in Mendoza, you mustn’t miss out on the fantastic wine tours, which you can do by bus or by bike, visiting beautiful wineries set in stunning scenery. Tastings are cheap and generous, while there are also great places to have lunch along the way too. We did no fewer than three tours while we were in town – read about them here. 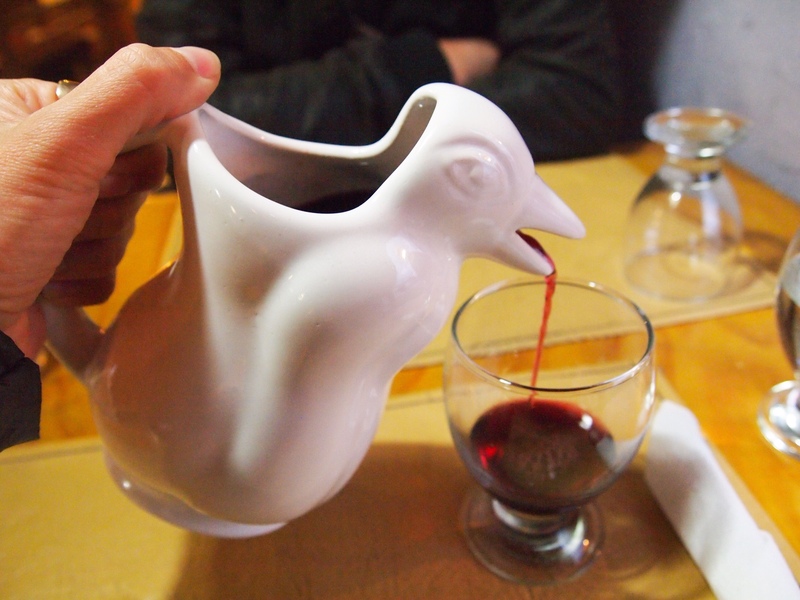 One last thing to mention… Argentina is the only place we’ve ever been where you can buy wine by the pinguino. This is obviously an opportunity not to be missed. Beer: The omnipresent local brew is Quilmes, nothing too special but a cut above the watery pilsners available in neighbouring Brazil. 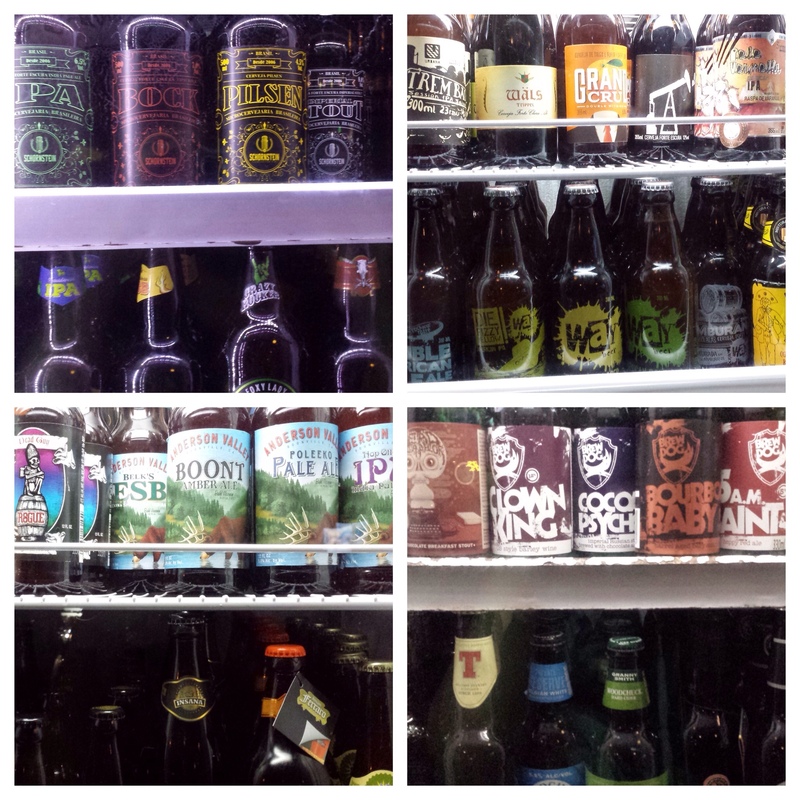 However, there is a delightful range of craft lagers and ales as well. In Buenos Aires, the Antares restaurant and brewery serves up bar-snack style food with a large range of brews such as Stout, Porter, Koelsch and IPA (pronounced ‘eepa’ here). But the real highlight for beer-lovers is Patagonia. This wild and beautiful region is home to some amazing small breweries churning out cracking cervezas artesanales. For the most part, you’re offered a simple choice of rubia (meaning ‘blonde’ but really just a golden ale), roja (red/amber) or negra (bock). The quality varies greatly as some of these places are really small operations out in the middle of nowhere. 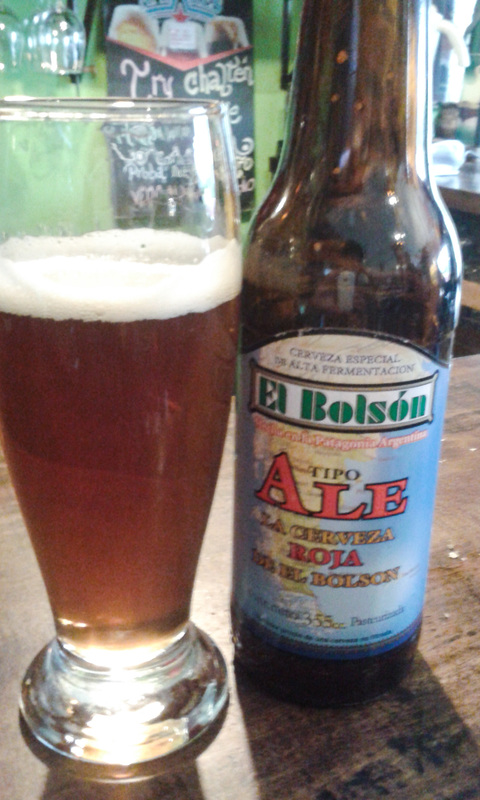 The El Bolson brewery in the hippy town of the same name has an incredible malty red ale that I absolutely fell in love with. The Berlina cerveceria, in the small village of Colonia Suiza near Bariloche, is another winner. If you find yourself in the trekking and back-country skiing mecca of El Chalten, way down in the south, there’s a wonderful little bar called La Vineria that has a huge range you should check out. But I’ll reserve particular praise for the Manush bar and restaurant in Bariloche. Unlike Antares, you won’t find their stuff selling for top dollar in Buenos Aires supermarkets. I didn’t see it anywhere but in the bar itself but my God was it good. Their IPA is rich, powerful and smooth, erring on the right side of uber-hoppy. My favourite though, German lager fanatic that I am, was the Koelsch. Smoky but fresh, it was the best example of the style I’ve sampled outside the Ruhr. Fernet: Very popular among locals, this is an incredibly bitter spirit usually drunk with full-fat Coke, presumably the only thing sweet enough to render it drinkable. I can see how it might be an acquired taste but when there’s Malbec and craft beer on offer, I can’t fathom why you’d opt for this. Top tipple: It ought to be a Malbec oughtn’t it? But that Manush Koelsch lager won my heart. Name your price Manush, I’ll have that stuff shipped over by the boatload when I get home. What to slur drunkenly: ‘Las Malvinas son Argentinas’. They are literally never going to stop going on about this so you may as well join in. Caipirinha: Where else to start but with Brazil’s most famous poison. Bewilderingly strong and insanely sugary, the main ingredient of this simple cocktail is cachaça, a spirit made from sugar cane. Mix it up with lime and yet more sugar, and you’ve got yourself a Samba party in a glass. The big difference between caipirinhas is the quality of the cachaça. At one end of the scale there’s the eye-wateringly potent stuff you get from street vendors for about 8 reals a pop (about £1.80). 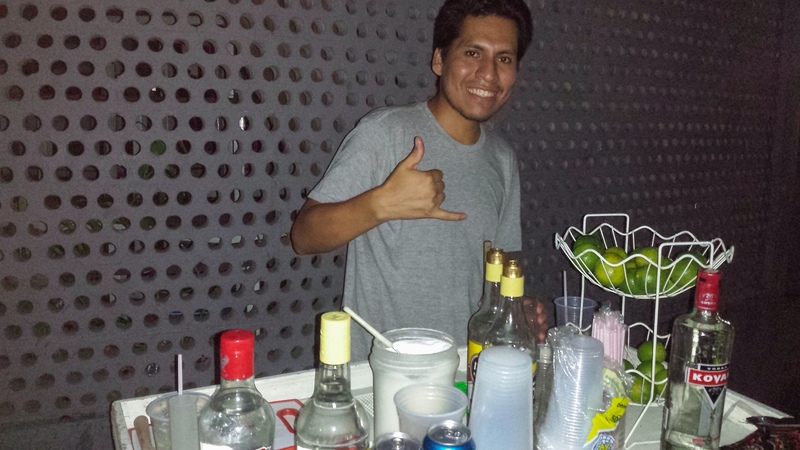 Here’s a Peruvian guy we met who set up a little stall in Lapa after someone sold him the cart. At the other end of the scale, ‘The Original’, available at the prestigious Skye Bar at the top of the Hotel Unique, will set you back a wallet-busting 38 reals (£8.50), largely because it’s made with the extra premium Cachaca Yaguara. Posh caipirinhas may not be authentic but they’re tudo bem. Tudo bem indeed. The Skye Bar version (a birthday treat for me) was certainly the smoothest and best tasting. But for value and authenticity, give me the three-in-the-morning street caipirinha in Rio’s party district of Lapa. Beer: The first thing to know about Brazilian cerveja is that they like it so cold that you can hardly taste it. That’s good news though, as most of it is dishwater. Itaipava, Schin, Devassa, Skol, Bohemia, Antarctica…it wouldn’t come as a surprise to find they were all the same weak product with different branding. Mind you, when it’s 40 degrees and you’re thirsty, flavour has to take a back seat sometimes. Not all is lost. You can find a great range of craft beers, mostly hailing from the south, which has a substantial population of German descent. Trouble is, good quality is just as expensive, if not more so, than what you’d find in London or New York. Still, if you’re fed up of the Pisswasser on offer elsewhere you’ll be ready to fork out. 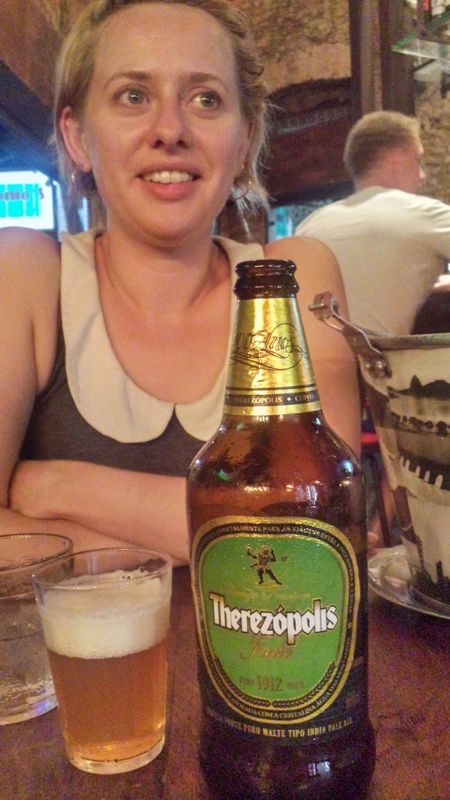 My recommendation is the Therezopolis Gold, smooth with a lightly sweet malt finish. Yum. For a huge range of Brazilian and foreign brews, head to the Boteco Carioquinha on Rua Gomes Freire in Lapa. It’ll set you back a bob or two but if you’re splashing out on beer, this is the best place to do it. One last thing to know about Brazilian beer is that it tends to be served in two forms. One is Chopp, roughly a half-pint usually with a sizeable head. The other is Longneck, a large bottle of around 500ml, usually served in a cooler to keep it as near to freezing as possible. Other: Coconuts abound anywhere near the coast, so there’s always the default Latin American beach tipple Cocoloco (see Booze of the World: Central America), a coconut with the top hacked off and some rum mixed with to the delicious nectar inside. I’m sure the Amazonian regions have some crazy local firewater but we didn’t venture that far. There is Brazilian wine but, for the most part, stay well away if you value your taste buds. However, over Christmas at the stunningly awesome Capim Santo hotel in the hippy beach town of Trancoso we stumbled upon the Casa Valduga ‘Indentidade’ Gewurztraminer, which was fairly complex, floral but not too sweet and very very drinkable. Wonders never cease. Try saying Gewurztraminer in a Brazilian accent. Go on, try it! Top tipple: Street caipirinhas. Cheap, authentic and damn effective. What to slur drunkenly: Brazilian Portuguese sounds like drunken Spanish anyway, so pretty much anything works. However, ‘tudo bem’ is your all-purpose expression of merry contentment. 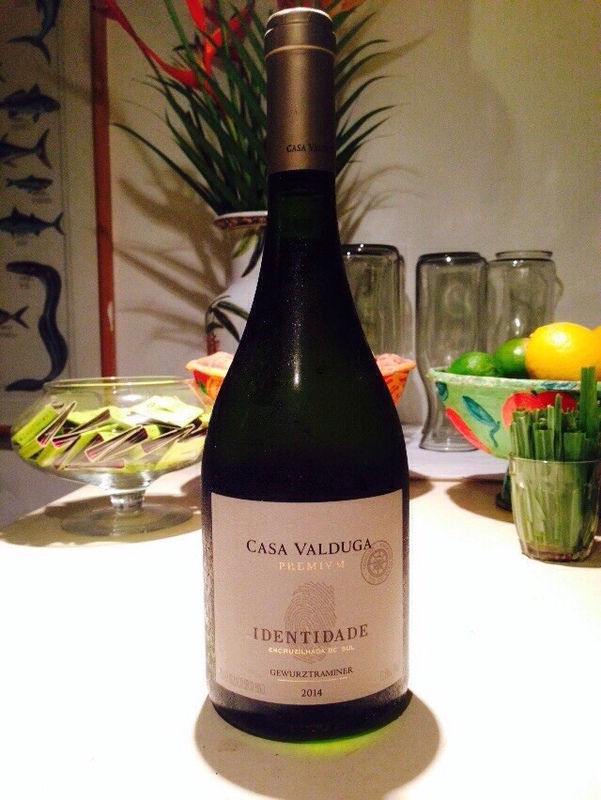 Special ‘Actually that’s not too bad’ award: Casa Valduga ‘Identidade’ Brazilian Gewurztraminer. 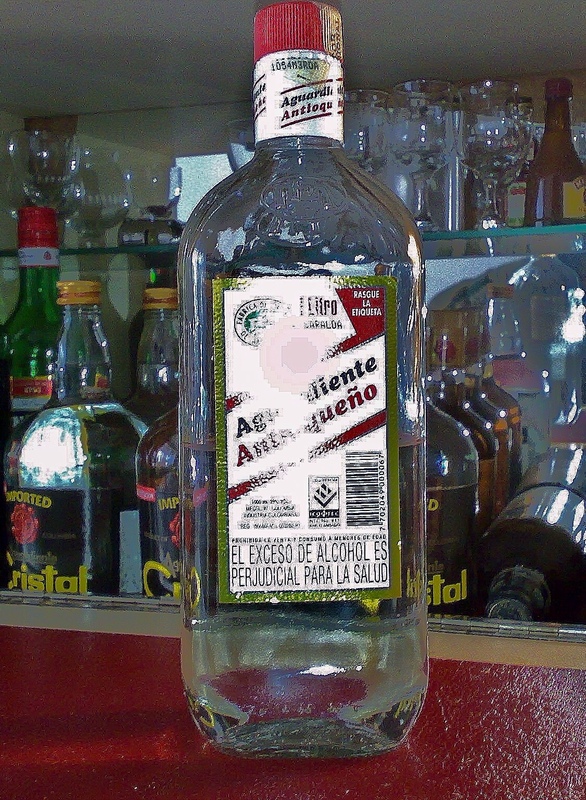 Aguardiente: Found in different forms across Latin America, aguardiente literally means ‘fire water’. In Colombia it’s a grimace-inducing concoction made of sugar cane and flavoured, unfathomably in my opinion, with aniseed. You’ll see the stuff being ordered by the bottle and shared around at parties and bars, particularly in the high mountainous regions. I’m probably not the fairest judge because I loathe aniseed and Colombian Aguardiente tastes like some evil genius fermented Liquorice Allsorts. Imagine someone extracted everything that makes Sambucca vaguely drinkable and you’re halfway to understanding the awfulness. 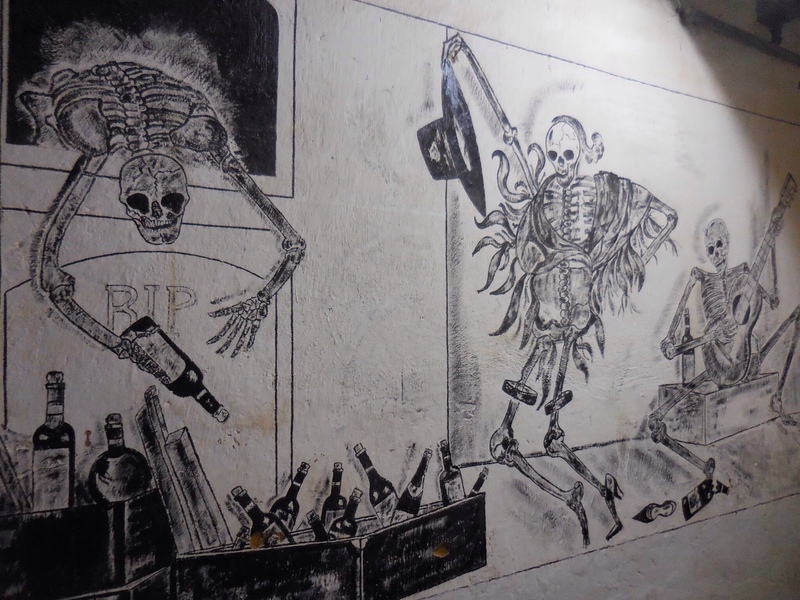 Check out this blog for a witty account of the horror of aguardiente. Beer: As we move out of Central America, the beer situation improves markedly. Yes, you are still assaulted with Latin much-of-a-muchness pilsners, such as Aguila, Pilsen and the slightly more complex Club Colombia. But Colombians have noted the micro-brewing revolutions going on elsewhere and are responding, with varying degrees of success. 3 Cordilleras, Moonshine and Apostol all boast a strong range including Pale Ales, Weizen and Ambers, most of which offer a decent alternative to light pilsner without being particularly memorable. They can be found in many supermarkets and some bars in the bigger cities too. The most successful among the new brewing breed is the Bogota Beer Company, which has the most impressive armoury of anywhere I’ve found in Latin America so far. Its range includes a 5% ABV ‘English recipe’ Chapinero Porter, the Candelaria Clasica IPA and the Monserrate Roja (red ale). I was particularly pleased with the Cajica Honey Ale, which succeeds in avoiding the sickliness you get with some honeyed beers. The highlight though was the Raquel pale ale from the Chelarte brewery, a robust and hoppy American ale at 5% ABV that could hold its own among what you’d find in any bar in Portland or San Francisco. 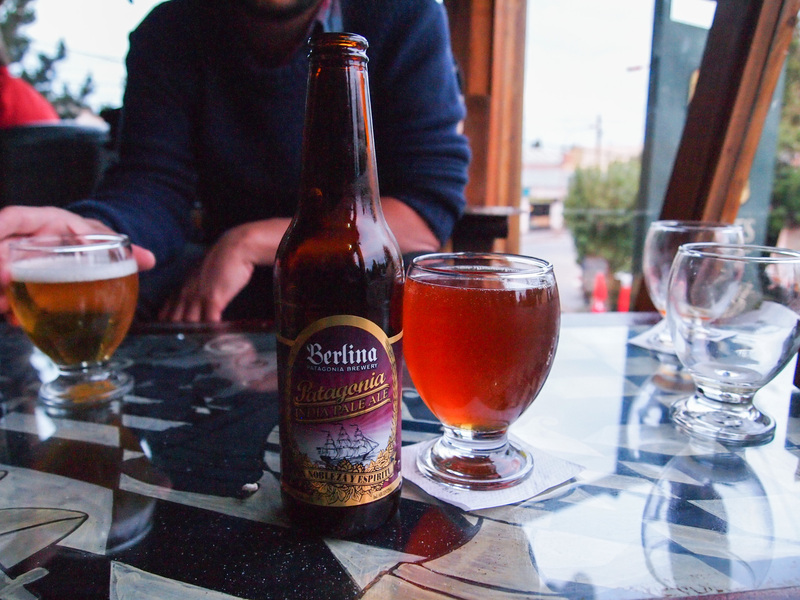 Here it is alongside a tasty Moonshine Amber Ale, served with dinner at Bogota’s wonderful Salvo Patria restaurant (featured in Franki’s ‘How to be a hipster in Bogota’ post). Other: Slim pickings beyond beer and aguardiente i’m afraid. Colombia’s big cities all have some high-end restaurants but if you’re drinking wine you will be emptying your wallet pretty quickly. If you like gin (hello Franki!) be prepared for a shock. It may be among the cheapest drinks in Anglo-Saxon countries but it sells for the price of a small car in Colombia. Honourable mention goes to the Agua de Mar restaurant in Cartagena, which has a comprehensive gin list, albeit for a king’s ransom. Being Caribbean, Cartagena also has plenty of rum on offer but nothing local to write home about. 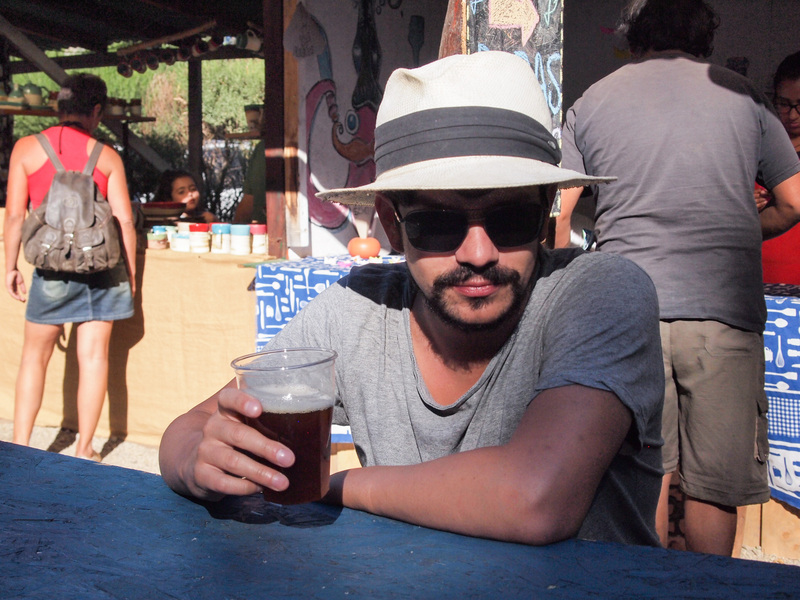 Top tipple: Un Cajica Honey Ale por favor. What to slur drunkenly: “I frickin’ HATE aniseed!! * Sobering tip: Do not leave your drink unattended. Drink-spiking with the aim of robbing or sexually assaulting people is a problem in Colombia. Be aware of where your drink is at all times and don’t accept anything from strangers that isn’t sealed when you get it. Beer: Back when I first visited in 2003, there were pretty much two beer choices: Gallo (the cockerel logo adorns a million backpackers’ T-shirts) or Moza. 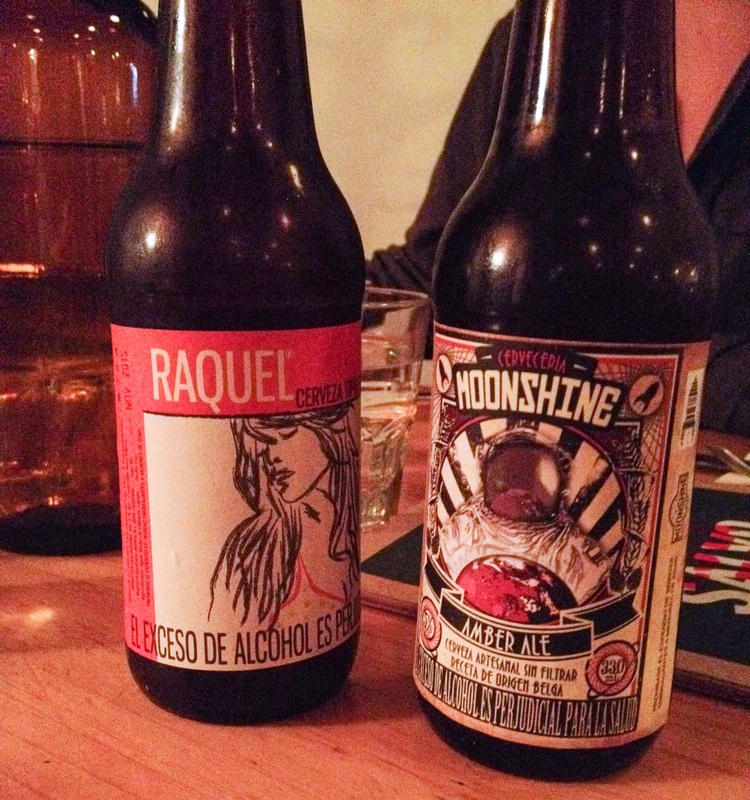 Both are made by the Cerveceria Centro Americana, owned by Guatemala’s powerful Castillo dynasty. Gallo, at 118 years old the country’s first brew, is the archetypal Central American beer: weak, pissy sub-lager with zero flavour and enough gas to power a small industrial city. It resembles Budweiser in that it tastes of nothing, but plasters its name across everything. I was always a Moza man and to this day it’s my favourite of what Guatemala has to offer beer-wise. It’s a dark Bock-style beer, richer and more flavourful than Gallo with a slight brown sugar aftertaste that suits my sweet tooth. There are a few other brews finding their way onto the menu in most bars and hostels these days though. The first is Brahva, owned by global giant AB InBev who (according to this BusinessWeek article) are keen on buying Cerveceria Centro Americana. Unsurprisingly, given that AB InBev make Budweiser, Brahva is if anything like a watered down version of Gallo and to be avoided at all costs. AB InBev’s muscle allows them to undercut Gallo on price too, which should worry anyone who values local production over many-tentacled multinationals. Brahva makes me want to drink Gallo and that shouldn’t happen to anyone with tastebuds. CCA’s Victoria is also growing in popularity. I prefer it to Gallo but it doesn’t offer much in the way of choice given that it’s also a pale lager. Same goes for their Cabro and Monte Carlo brands…different label, same marginally tweaked weak fizz. I’d stick to the Moza every time but that’s very much a minority view in Guatemala. And ales? Forget it. Beer with a twist: One odd quirk I was introduced to in Guatemala this year – although I believe it comes from neighbouring Mexico – is the Chelada and its spicier cousin the Michelada. The former involves adding lime to your beer and salting the rim of the glass, as you would with a Margarita. The latter is much the same only with a variety of spices, or tabasco, added as well. They both sound hideous. Which is because they are, although i can imagine the limey Chelada might work on a very hot day. Still, if you’re drinking Brahva or Gallo, any added ingredient short of cyanide might be an improvement. Rum: NOW we’re talking. You’d expect the world’s best rum to come from Jamaica or perhaps Cuba. Not according to many rum experts, who put Guatemala’s Ron Zacapa at the top of the tree. Or should I say the sugar cane. Its success is despite the fact that its history is relatively brief. It was first produced in 1976 to celebrate the 100th anniversary of the eastern Guatemalan town of the same name. They say its quality is down to being stored at altitude in the volcanic highlands. I sampled the stuff in a little wine and rum shop in Antigua, Guatemala almost directly under the famous arch of Santa Catalina. When I was last in Guatemala there was no way I could have afforded a glass of Ron Zacapa. Much the same is true now but I felt I had to do my duty for Booze of the World. Altruistic, right? I sampled both the 6-to-23-year-old Zacapa Centenario and the XO, the premium option at 6-to-25 years old. Both embrace you with their warmth from the first sniff, the vapours filling your lungs and circulating a fuzzy glow around your whole body. While the XO is the super-premium brand, I found it almost too subtle. It was so smooth that it lost something of the sugary mouth-burn I like about rum. The Centenario was a revelation though. Multi-layered, nutty and caramelly without being sickly, with a long aftertaste. You’ll pay top dollar for this stuff anywhere outside Guatemala but if you like rum, you need this in your drinks cabinet. NB: If you even THINK about putting ice in this, please reseal the bottle and give it to someone who deserves it. And if the word ‘Coca-Cola’ enters your mind, seek professional help. Quetzalteca: Every country has at least one traditional drink of the people and this is the main one for Chapins (Guatemalans). Named for the Quetzal, the colourful bird that also gives Guatemala’s currency its name, this is a bit like an eau de vie. There are several flavours but I tried the Rosa de Jamaica. It packs a punch but not the body-shuddering donkey-kick you get with some traditional hooches of the peasantry. Surprisingly drinkable although i’m not one for neat spirits. Beer: Guatemala ain’t great for beer but Nicaragua is worse. On the first night I tried the Toña, which tastes like someone spilled a thimbleful of Budweiser in your Evian. That’s being kind. A step up from that is Victoria, a pilsen which has a bit more character but is still (can you sense a pattern emerging in Latin America) a pretty uneventful pale lager. Still, in the baking heat after a long hike in the mountains, it might as well be Ambrosia. Ever seen the film Ice Cold in Alex (look it up here)? Extreme heat is the only way to make Nicaraguan beer taste good. Oh, there’s also one called Premium aimed at the higher end of the market although the only thing premium about it is the name. 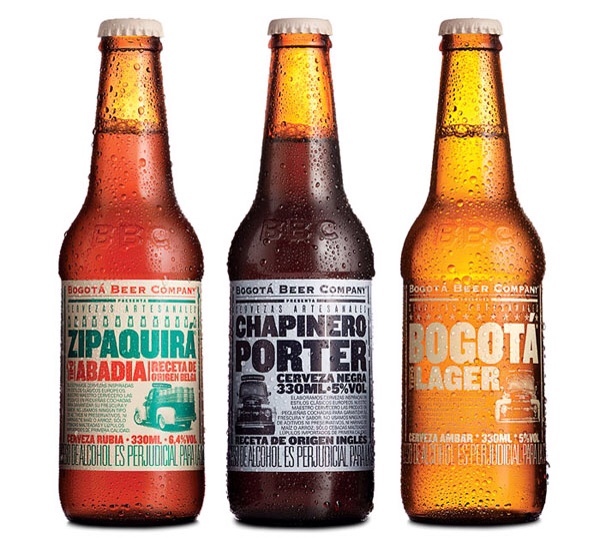 All three are produced by Compania Cervecera de Nicaragua, which is in serious need of some competition. Rum: Nicaraguans are proud of their Flor de Caña and you can’t blame them. It’s got much more character than your bog-standard high-street rum and there are some premium versions too. I can’t say I gave this one the same consideration as Guatemala’s Ron Zacapa but then, once you’ve had Ron Zacapa, everything else pales in comparison. What else? : It’s usually not worth ordering wine with dinner in Guate or Nicaragua unless you want to drink something dreadful or pay top dollar. Franki and I chose to have a few dry meals rather than shell out the same price we’d pay in London for some dodgy ‘vino tinto’ from the part of Argentina they clearly reserve for ‘countries we don’t mind offending’. As a footnote, no country with a Caribbean coast is ever without the option of a Cocoloco, a coconut sliced in half with a machete and then sloshed with rum to add to the delicious nectar within. Top tipple: It can only be Ron Zacapa. I prefer the Centenario but if you’re the kind of person who likes the most expensive label, give the XO a whirl. Either way, you’ll be feeling more cosy and warm than a Werther’s Original advert. Gourmet’s choice: Ditto. In this case the most expensive is also the best. Bubbling under: I’m a sucker for Guatemala’s Moza. Slips down nicely after a day in the limestone pools of Semuc Champey, climbing a volcano or sweating through the jungle of Tikal.